It's the start of the week, and I'm super excited to share with you the start of my new series: CAS (Clean and Simple) Challenge! Anyone who's followed this blog for some time, knows just how truly challenging this is for me, and that I've been trying to pare back for some time - mostly because it's fun to try something new, but also because layered cards take forever! Not that I mind, but sometimes it's really nice to be able to walk away with a finished card in 15 mins :) So this monthly challenge is devoted to just that. 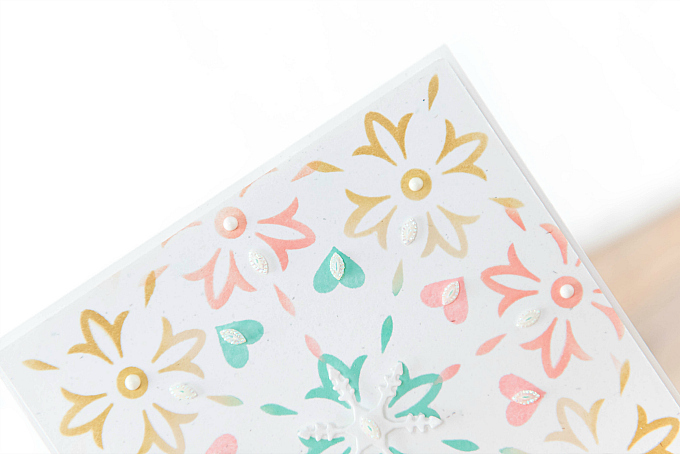 And there is no better way to usher in a speedy finish, than with today's feature: a single layer stenciled card. This little number was very easy to pull together. The biggest challenge was deciding which stencil to use, picking my color combo, and finding just the right accents. Not too shabby, right? To start this card, I cut a square base out of some cardstock and covered it with one of my favorite stencils from Martha Stewart. I can't find it for sale any longer, but I think you could get a similar look with this stencil here and a more "reversed look" with this one here. But the possibilities are endless - I urge you to just dig around your supplies or explore with a totally different design. 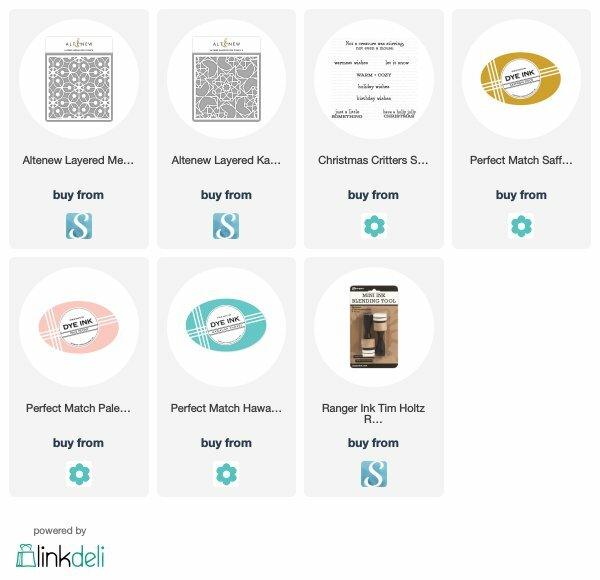 Once I had my stencil positioned, I used masking tape to secure the stencil onto my work area, and picked up three colors, Pale Peony, Hawaiian Shores, and Saffron Spice, as well as my ink blender tool. I added the aqua color to the center, slowly blending it outwards, and then added some mustard to the four corners, and finished off the rest with this soft peachy pink. I love how the colors fade into one another! 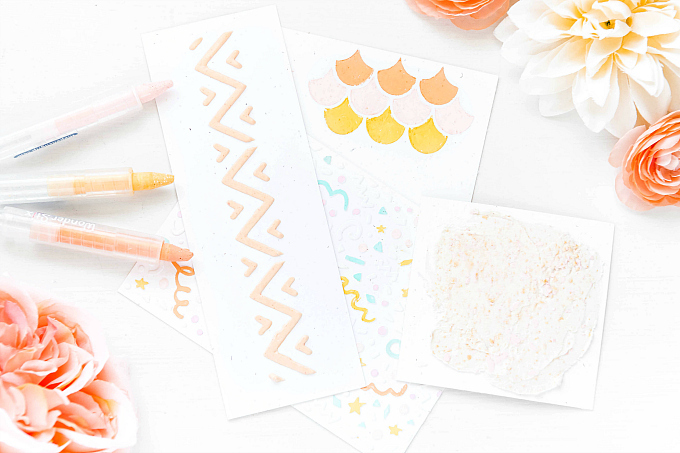 I encourage you to play with different colors - you'll be amazed at how your stencils come to life! In the center of the card, I added a snowflake die-cut, accented by some almond-shaped iridescent rhinestones (from my stash). For the sentiment, I used PTI's Christmas Critters stamp, and embossed part of the sentiment. So much fun making this quick card! 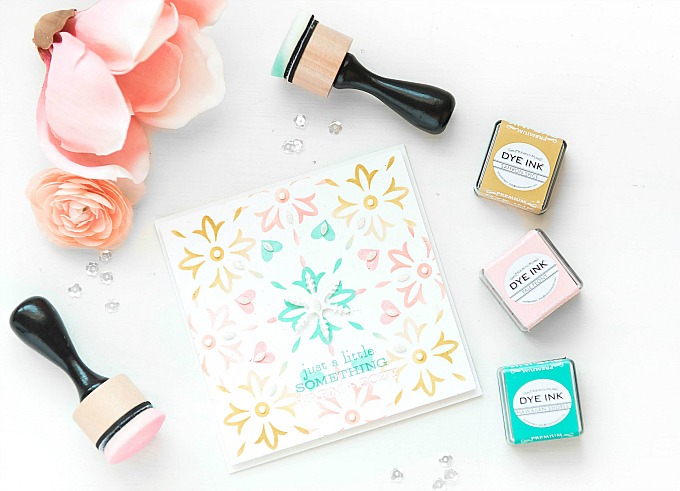 If you find your hands reaching for your stencils and inks, we'd love to see what you make! You just reminded me that I have an Altenew stencil that has never seen ink! I won it months ago and it just slipped my mind. Your pretty stenciled card has inspired me. Your colors are always so soft and lovely and this is no exception! You totally ROCKED the CAS. I love that stencil and your idea of putting the snowflake in the middle is GENIUS!! It looks so pretty with your color choices. I think you have the CAS design down pat! I've been leaning more & more to CAS, so look forward to this series, Ivana! I mail lots of cards & would like to spend less on postage, so that's part of the reason. I have lots of stencils, but tend not to use them. You've inspired me, once again!